French screenwriter and director Luc Besson (The Fifth Element) teams up with This Means War, Charlies Angels and action TV series director McG in an uneven tale of a professional CIA hitman, Ethan Renner, expertly played by an aged Kevin Costner who after a botched operation in Belgrade returns to Paris to reunite with his estranged wife and daughter, Christine and Zooey Renner, played by Connie Nielsen (Gladiator) and a brilliant Hailee Steinfeld (True Grit). Renner learns that he has a rare form of brain cancer which prompts his sudden and awkward reunion with his Parisian family while discovering that he has really been an absent father to the now teenage and rebellious daughter Zooey. In the scenes between Costner and Steinfeld, the narrative works beautifully but in between all this familial reunion is a spy plot involving a femme fatale CIA agent Vivi Delay seductively played by Amber Heard (The Rum Diaries) who coerces Renner back into operations as a professional assassin in a bid to discover the whereabouts of The Wolf played by German actor Richard Sammel (Casino Royale, Inglourious Basterds) who is viciously protected by a henchman The Albino, played by crystal clear blue-eyed rogue Icelandic actor Tomas Lemarquis. In between the vicious action sequences and Renner’s constant attempts to reconnect with his teenage daughter is an elliptical narrative which will often confuse and confound audiences, but nevertheless entertain them. Overall impression of 3 Days to Kill was that is was a typically European action film in the vein of Taken or Unknown, directed by the wrong director. If Luc Besson himself had directed 3 Days to Kill, the uniformity of vision in the films narrative would help bolster the general credibility of the story, that of an aged assassin who wants to reconnect with his family before his dying days commence. 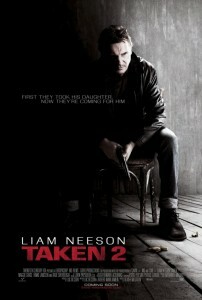 As screenwriter Besson as displayed in the Taken franchise definitely has a penchant for setting his stories about tough old fathers reconnecting with their vulnerable daughters. 3 Days to Kill is slick, flashy and generally entertaining especially with such stars as Costner and Steinfeld playing father and daughter in a rather tender scene on the steps of Le Sacre Coquer, but generally the Parisian locations do little to bolster the overall vision of this Nikitaesque type film. Naturally Amber Heard makes the best of her roles as the lethal CIA operative Vivi, complete with dazzling outfits and sleek sportscars. 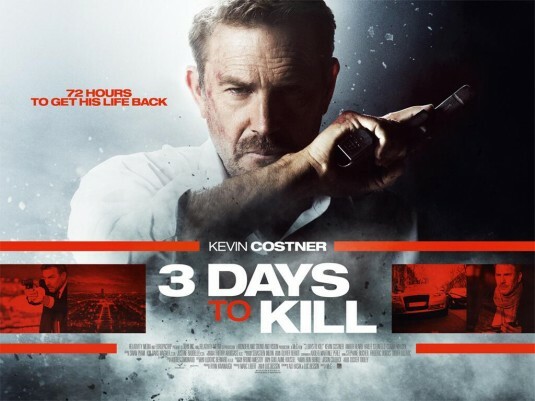 3 Days to Kill is not a terrible film, but it could have been so much tighter, better plotted and conceptually driven if Besson (The Lady, Leon, The Professional) had taken the reigns as director. American action director McG (also known as Joseph McGinty Nichol) should stick to the type of comic action films like This Means War and The Charlie Angels franchise and avoid delving into a far more European aesthetic. It simply does not suit his episodic style which he naturally got as TV director for the popular action series Chuck and Nikita. 3 Days to Kill is a fun, but not a provocative or gripping thriller.